Just two weeks, that’s all it’s taken. 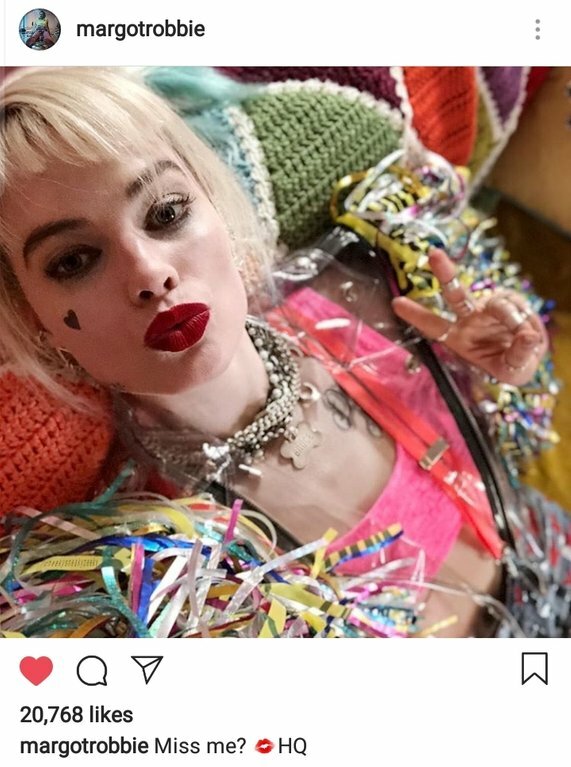 Two weeks in to production of Birds of Prey ( and the fantabulous emancipation of one Harley Quinn) and on Monday we got our first look at what’s to come from Cathy Yann in her debut in the Comic Book movie genre. Completely unexpectedly on Monday afternoon a twenty second clip surfaced online, giving us a glimpse at Harley and her girl gang. I’m sure by now that everyone who is interested in this film has seen the clip plenty of times so I won’t bore everyone with breaking down everything we see in the teaser, instead just pick out a few points that I’m especially interested in. Getting this footage so early on in production does seem like a great new way to introduce the characters, giving us a first look at Black Canary and Huntress and “Bad Guys” Zsasz and Ewan McGregor’s Black Mask (even though there was no mask just yet). Margot Robbie’s Harley Quinn was without doubt one of the success stories of the DCEU so far and fans have been waiting for any update on the character ever since Birds of Prey was confirmed so to get this video now plus a photo from Robbie’s Instagram has certainly got people talking. The full title of the film tells us a bit about what to expect from Harley and how she has left the Joker. One of the shots we see looks to be Harley with some of her tattoos crossed out and some not even there at all, noticeably the one that said “Daddy’s lil Monster”. So maybe she has had her Joker related tattoos removed or this could be a flash back to before she had them. There’s an opinion online that it isn’t even Harley at all and that it could be Black Canary. What do you think? – UPDATE : IT HAS NOW BEEN CONFIRMED THAT THIS IS INFACT BLACK CANARY. I was really impressed with the close up we got of Jurnee Smollett-Bell as Black Canary. She’s holding a gold microphone and seems to be a singer or front woman in a band. In the past the character has been part of a rock band so this is in keeping with that. Plus she does have the blond hair and what resembles fish nets as a glove. Both things associated with Dinah Lance. Of course we get our first look at Mary Elizabeth Winstead as Huntress and Rosie Perez as Renee Montoya. For these characters there’s very little for the viewers to go on other than Huntress with her crossbow and Montoya with a nightstick. This is also true for Ewan McGregor. Our first look at Black Mask seems to be the actor standing there looking exactly like himself in a suit. That’s fine for now though, we’re all looking forward to seeing Roman Sionis in a live action film for the first time and I’m certain that the mask reveal will be a big moment in the movie. Finally there is a glimpse at the young Cassandra Cain. 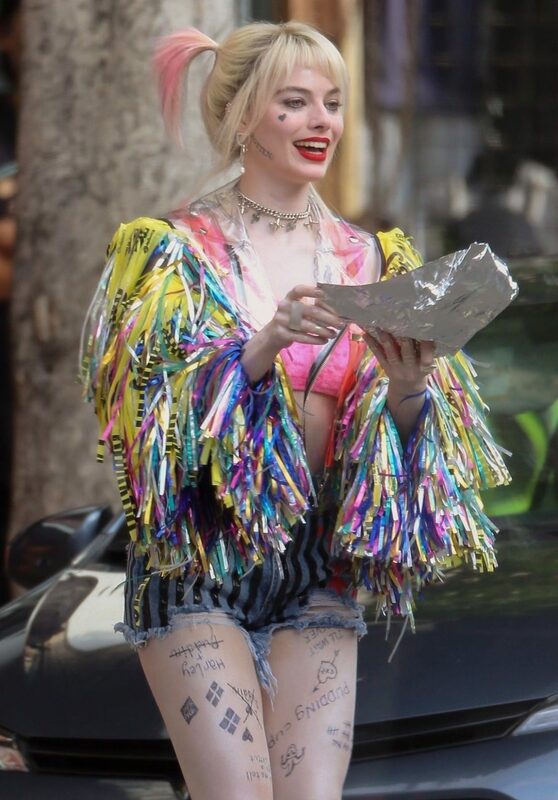 Again there’s not much to take from it apart from she has her arm in a sling which is covered in writing that looks like it could have been written by Harley herself. I’m hoping that a little further in to production we will get some kind of individual character videos, giving everyone a much more detailed look at each member of the film. This looks to be the same outfit Harley is wearing at the end of the teaser, only here we get a closer look at what it says on her necklace and on what looks to be a dogs ID tag it says Bruce. This leaves us with plenty more questions than answers. Why would she be wearing a tag with Batman’s name on? Since the clip was released a week ago a few set photos have leaked online. There are a few in particular that giveaway something that could happen in the film and because of that I’m not going to be talking about them or showing them here. As we have seen with the upcoming Joker film leaked set photos can be a real problem and they spread very quickly on social media. In the build up to a highly anticipated film I only want to see what the film makers want us to see and not have any plot points given away in an unofficial photo or video. For just twenty seconds we do get quite a lot to take in but very cleverly hardly anything is given away. It just leaves us wanting more.